Right angle grinders are used to grind off the uneven metallic surface, smoothing out the metallic beads formed at the joints after electric ark welding. 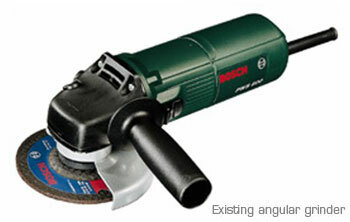 As the grinding wheels remain at 90° to the axis of the motor it is called right-angle grinder. There are many different types of right-angle grinders available in the market depending on the combinations of the torque and speed. I chose to work on a segment were smaller hi-speed (~11000 rpm) lower torque machine are used. It’s used by mostly fabricators. 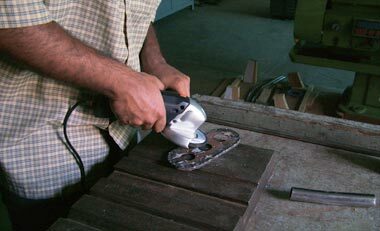 But another affordance of this tool is marble cutter, as the normal marble cutters are not capable of going till the edge of the floor; right-angle grinder is often fixed with the cutting wheel of the marble cutter! Which makes it really unsafe, as the wheel guard cannot be used during the use as marble cutter. >> The wheel guard is not used by the user as it becomes an obstacle to the job. Due to which, it causes fetal accident to the user and the people around when the grinding wheel explodes. 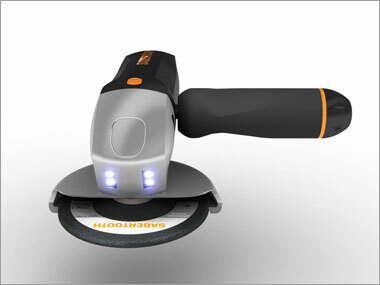 >> Misuse of the grinder as marble cutting machine causes a large number of accidents. >> Some models get heated up due to lack of air flow which results the armature fuse. 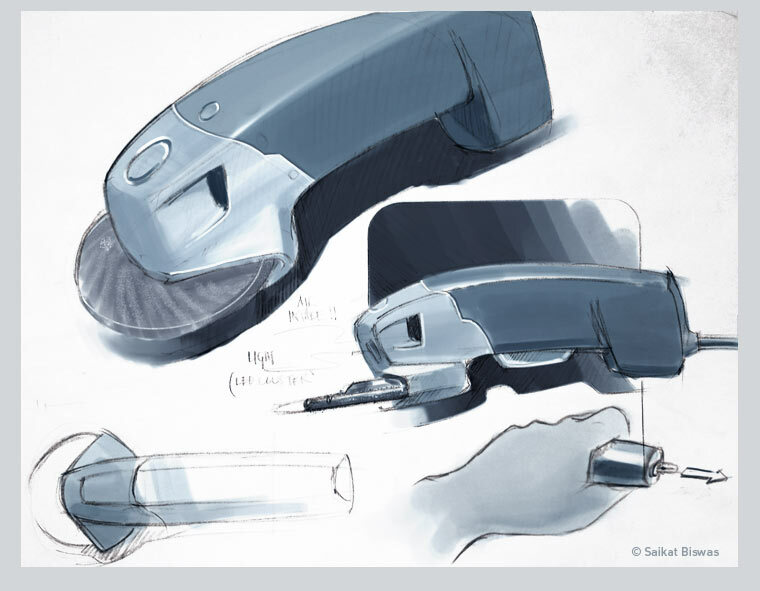 >> It can be used by either right handed or left handed user at a time. >> As there is no power indicator, the users generally turn on the switch to check if there is electricity, which could cause accident. 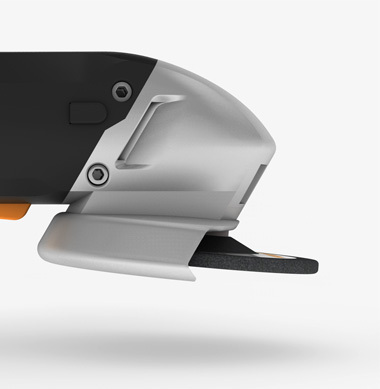 >> If it falls from hand while using it does not stop and can create accidents to the user and the people around. In the initial concepts I tried to address the issues I discussed above. 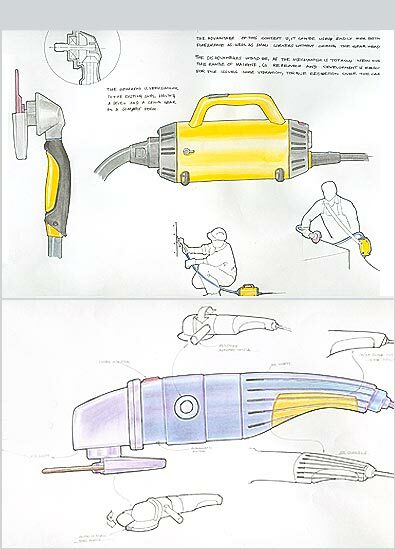 Some concepts were dealing with better visibility, better air-flow and cooling, flexibility for different kinds of jobs; where the others were dealing with better ergonomics, compatibility with both right and left handed users, emergency power cut etc. 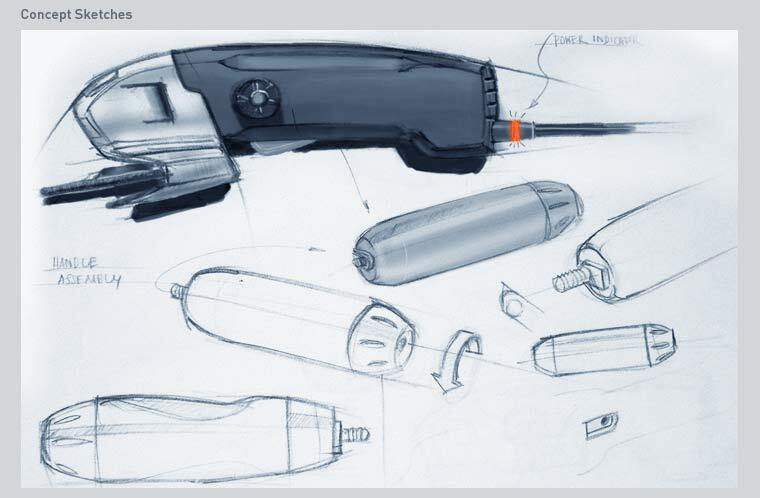 Some of these concepts were decided to integrate into the final product, but at this stage the problem was to decide the form. I was looking for some more integrated form unlike most of the existing angular grinders where the grinding wheel and wheel-guard remains non-integrated with the rest of the form. So I took an approach of taking inspiration from some animal. All later forms were inspired form were inspired from Sabertooth, the extinct prehistoric cats of the having long sword like upper canine teeth. 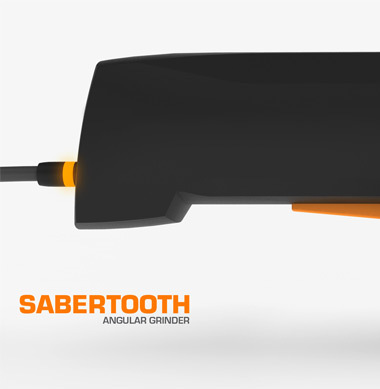 Thus the name of the name of the final product is called Sabertooth. It symbolises the power and aggressiveness of the machine. 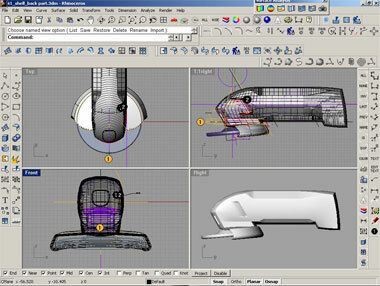 After finalising the design I started 3D modeling in Rhinoceros 3D. 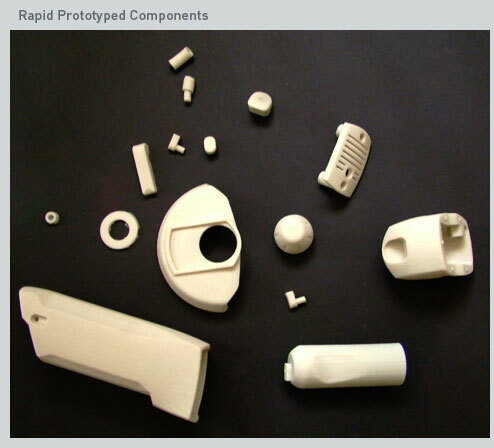 As I knew that I need to use rapid prototyping for the prototype, the approach was quite different than my previous projects. As Rhinoceros 3D does not have “Shell” function like most parametric 3D modeling packages, I had to do it manually as the STL files need closed poly-surface for 3D printing. 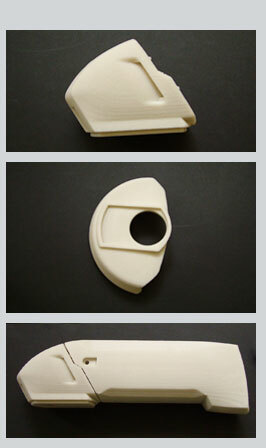 All the parts were exported separately for rapid prototyping. The RP parts were finished, painted and assembled to get the finished model. To simulate the weight some metal pieces were fixed inside. 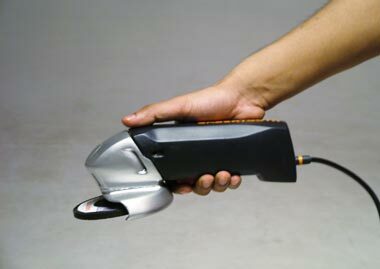 Acute angled wheel: The grinding wheel is fixed at 80° to the axis of the motor unlike the existing ones at right angle, which makes it much easier to be maneuvered by the user. 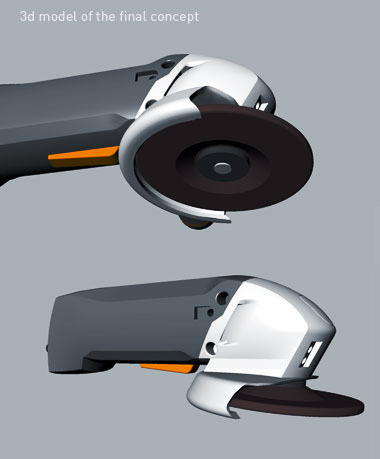 This is one of the most fundamental changes in the new design which makes it ‘Angular Grinder’ from ‘Right-angle Grinder’. More ergonomic: The acute angle of the wheel also helps to make it more ergonomic by keeping the hand at more natural position and thus less fatigue. 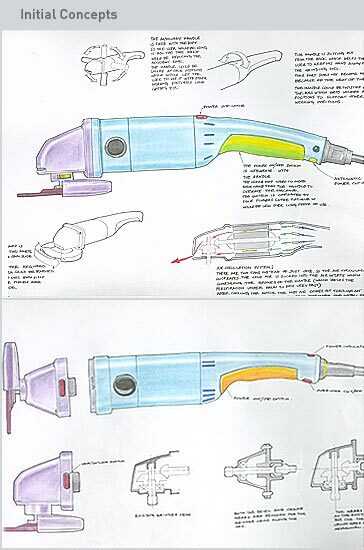 Air circulation: There are two cooling fans which creates more air circulation keep it cooler making the motor perform better and long lasting, the air is sucked in through the back the grinder and pushed out through the front ducts which helps to push off the metal particles that comes out after grinding. 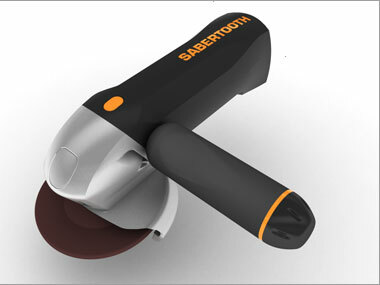 Chamfered form: The form with big chamfers makes it more ergonomic to grip the grinder. Integrated wheel guard: The form of the grinding wheel is such that it does not become an obstacle to the user to see the job. This makes it possible to completely integrate with the rest of the body unlike any other existing grinder, which make it much more appealing and much safer from accidents as discussed above. Power indicator: There is a power indicator at the end of the plug which makes it easy to see if there is power or not, which helps to avoid any accidental start. 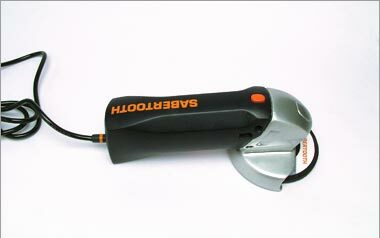 Auto cut off: If the grinder falls from hand it automatically cuts of the power and shuts the power off which helps to avoids accidents. LED lights: There are 4 powerful white LED based lights which makes it possible to use in the dark. Multi user adaptable switch: The main switch is positioned in such a way that it can be equally accessible by both right and left handed user without any addition adjustment. 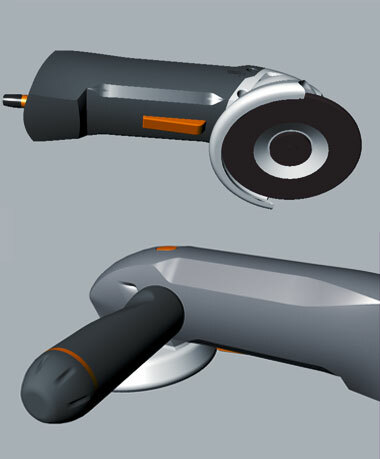 Secondary handle: The secondary handle can be attached in no time by its integrated screws for more precise works. It has rubberized cushion which make is more comfortable.